Over the last couple of months big things have been brewing down at the Two Beers Brewing in Seattle’s SoDo neighborhood. Most notably, they are expanding into the space next door and are now poised to open the new taproom. The beautiful new brewing equipment, which they recently installed, is encroaching on the exiting taproom. Increased brewing capacity, more packaging, and more room for the public to enjoy the product onsite. Instead of me telling you the details here’s the press release. I first had the opportunity to try their beer at the last 'Cans Fest' in Portland, OR. I was pleasantly surprised, and immediately starting asking around if any of their kegs and cans were even distributed around the local Portland/Vancouver metro area. Only until recently have I spotted some tappings at By The Bottle, as well as some cans. SEATTLE (November 2, 2011) – After what has already been a record-breaking year, Two Beers Brewing is excited to announce the expansion of its popular SoDo location. Thanks to growing demand for the brewery’s dynamic selection of Northwest-style beer, Two Beers Brewing is in the midst of expanding its production facility to 4,800 square feet – double its current size – allowing for increased production, a dedicated tasting room, new packaged products and much more. Two Beers Brewing – which produced just over 1,100 barrels (34,100 gallons) in 2010 – is now on pace to eclipse 3,500 barrels (108,500 gallons) by the end of 2011, just four years after opening. The expansion project adds 2,400 square feet of brewery space, allowing for the addition of a 15-barrel state-of-the-art brewhouse, up to five additional 60-barrel aging tanks and up to 15 new 60-barrel fermentation tanks. With room to grow, the new space will allow for future production of up to 28,800 barrels annually. The added space also allows for the installation of an automatic canning system capable of producing 60 cases per hour, bringing the brewery’s can production – currently accounting for 23 percent of the brewery’s total sales – up significantly from the current 12 cases per hour. The new production capabilities will allow for the introduction of five new packaged products to the market. New 22-ounce bottle offerings include Heart of Darkness Imperial Cascadian Dark Ale (CDA) and SoDo Brown, while new 12-ounce cans – available in six-packs – include Persnickety Pale Ale, Immersion Amber and SoDo Brown. A dedicated tasting room is another feature of the newly expanded quarters. Double the size of the current space, the new tasting room will feature twelve tap handles showcasing Two Beers Brewing’s award-winning beers, six dedicated growler filling stations, seating for 62 people (not including the sun-filled dock) and a beautiful custom built bar. Additional features include a dedicated storefront, HD TVs for watching the game and more. The tasting room – which will continue to serve pints and tasters, as well as offer growlers, kegs, cans and bottles to go – will feature new tasting room hours, open Tuesday through Friday, 3 – 8 p.m. and Saturday, noon – 6 p.m.
To celebrate, Two Beers Brewing will be hosting a Grand Opening on Saturday, November 12 from 2 – 7 p.m., coinciding with the brewery’s fourth anniversary. Enjoy $4 pints, beer-infused food from Skillet Street Food, tours, limited edition beers, free anniversary poster and more! The event is open to the public; dogs and kids are welcome. Available on tap in more than 300 restaurants and bars statewide, Two Beers Brewing offers twelve beers – including five year-round, seven seasonal and a host of intricate infusions. For more information, be sure to follow Two Beers Brewing on Facebook, Twitter or visit www.twobeersbrewery.com. Media interested in attending a sneak peek preview of the tasting room on Thursday, November 10 between noon – 4 p.m. are encouraged to contact Caitlin Braam at caitlin@twobeersbrewery.com. 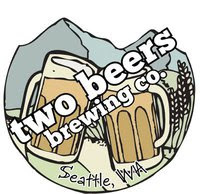 Retailers interested in learning more about Two Beers Brewing’s line of cans and bottles should send inquires and requests to getmebeer@twobeersbrewery.com."